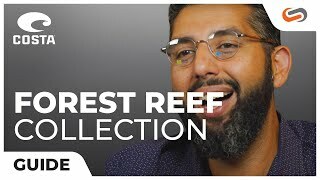 Part of the new Costa Forest Reef collection, the Forest Reef 100 eyeglasses are made for anything. This casual pair of eyeglasses was inspired by the ancient underwater forests in the Gulf of Mexico. Its lightweight rounded acetate frames give a perfect combination of comfort and flexibility. Suggestive of wooden boats, underwater trees, and sandy beaches, Forest Reef 100 is the classic pair of prescription eyeglasses.